The Degree Audit is found on My Profile > Student. It compares your academic history with your school's degree requirements (majors and minors, too). It also lets you (and your advisor and registrar) see how your courses and credits would apply to the other degrees your school offers. The audit is meant to help someone make a decision. You might review it and decide to switch degrees. Your advisor might decide to recommend one class over another. The registrar might decide to grant you a degree. You get the idea. Here's how to compare degrees and understand what the audit is telling you. The degree audit starts by showing your the most advanced degree you're currently pursuing. To see other degrees and options, select from the drop-downs. You can change degrees, catalog years, and specializations (majors/minors). When you make a selection, the audit automatically updates. 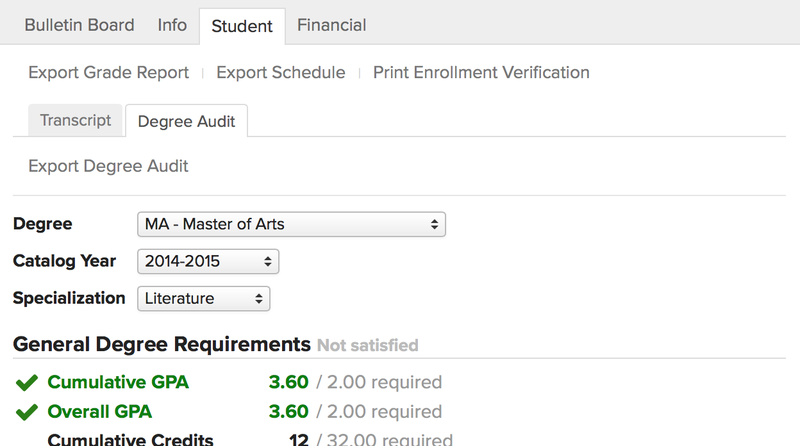 Click Export Degree Audit to create a PDF of the audit; the export will match whatever options you've selected. General Degree Requirements are the big-picture items that describe your academic achievement: GPA, completed credits or hours, and resident credits/hours. Green items with a big green check indicate that you've met the requirement. Grey or black items indicate that you've not met the requirement. When all of the general requirements have been met, you'll see a green notice saying that the requirements have been satisfied. Degree course requirements are the particular course and grading requirements for the degree. They're organized using course groups, which are sets of courses that serve a particular function in your course of study (e.g. Core Courses or Electives). 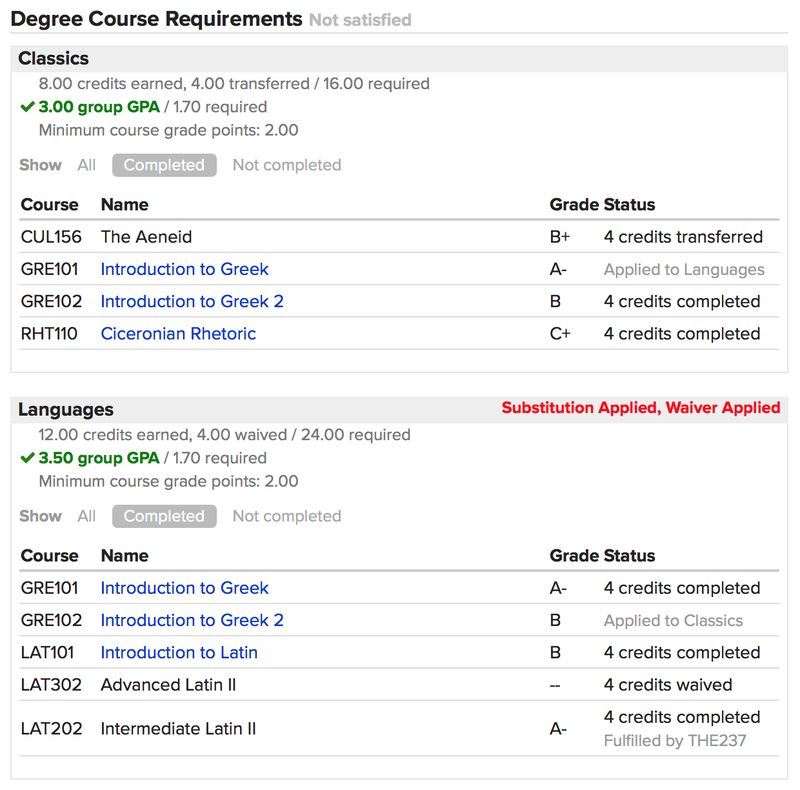 Courses count toward the requirement when you've completedthem: your final grade meets the minimum grading requirements for the course group. Each course group leads with a summary of the requirements and whether you've met them. As is customary, green indicates that the requirement has been met! If a substition, waiver, or exception has been applied that affects this course group, you'll see a red notice to that effect (see below). X credits/hours/courses completed: You've met the minimum grade requirement for this course and earned X number of credits/hours that have been applied to this course group. Courses are also considered completed you have completed an equivalent course or if another course has been substituted for this one. Applied to X: You've met the minimum grade requirement for this course and it is being used in a different course group. X credits in progress: You've not completed this course; when you do, it will be applied to this course group. X credits transferred: This course was accepted as a transfer course and has been applied to this course group (or one of the courses in the group). X credits waived: This requirement has been waived for you; you are not required to complete it. Unused courses are completed courses that are not included in any of the degree's course groups. They count towards the degree's general requirements but do not count in degree course requirements. Click to show all of the courses in the group, those that have been completed, or those that have not been completed. If any degree requirements have been modified or waived for you, you'll see them at the bottom of the degree audit.